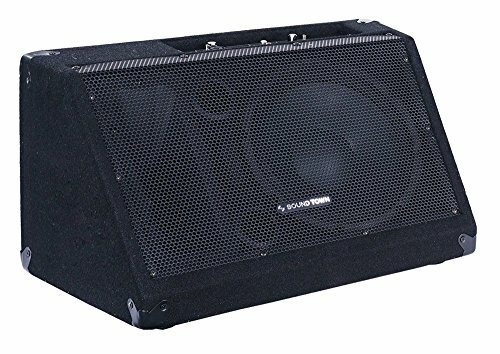 Sound Town METIS-10MPW 10” Powered Stage Monitor Speaker The Sound Town METIS-10MPW is a powered 300 Watts stage monitor speaker with massive power, impressive quality, great portability and it doesn’t break your bank. Inside the low-profile enclosure are one 10” powerful woofer and one 1” titanium compression tweeter. The METIS-10MPW stage monitor doesn’t just provide amazing sound quality; it also delivers a wide sound coverage. Being able to hear well, the artists will love coming back to perform on your stage. The Sound Town METIS-10MPW stage monitor speaker comes with two 1/4” jacks and XLR inputs, one RCA and 1/8” MP3 input, which makes daisy chaining with other speakers a breeze. Engineers at Sound Town understand how important it must be for a speaker to be portable and easy to transport. Therefore, the stage monitor is built as a compact design; it has one recessed handle and doesn’t create a large footprint on your stage. Its rugged exterior with full metal grille and four metal corners holds up to road applications. For a top-quality, powerful and affordable stage monitor, check out the Sound Town METIS-10MPW. Manufacturer: JAYLYN SOLUTIONS GROUP INC. Publisher: JAYLYN SOLUTIONS GROUP INC. Studio: JAYLYN SOLUTIONS GROUP INC. If you have any questions about this product by Sound Town, contact us by completing and submitting the form below. If you are looking for a specif part number, please include it with your message.